When Elaine asked me to join her at the 2014 TEDx conference to be held at the Sydney Opera House, I didn't ask any questions and applied immediately. I've been a fan of TED talks for as long as I can remember, so luckily for Elaine it was an easy sell. But when my calendar started to fill up with cake orders and work deadlines started to creep up on me, I reluctantly decided to pull the plug on our original plan to attend together, despite the fact that my application to attend was successful. Fast forward to last Wednesday afternoon when an unexpected invitation to TEDx presented itself in the form of a text message. I could only take it as a sign that I needed to be there. So I made some sacrifices and rearranged my calendar and rsvp'd a big YES. For anyone who isn't familiar, TED has been around since 1984 and is completely rooted in one simple principal: to provide a media platform for ideas worth spreading. (Oh, and TED is for Technology, Education, Design.) These talks are usually presented in front of an inspiration hungry audience, and run for 18 minutes or less. There's a TED talk on everything, and if you haven't experienced a TED marathon, ( Friday night, youtube, popcorn, notepad, tea) then you haven't really lived. Since kicking off PSS, I have met some wonderful, warm and kind hearted people. Meet Joy Leaper. She's one of those girls that you feel like you've known for years after just one coffee session. Joy and I had been in touch over the past few months trying to tee up a coffee catch up, but didn't have any luck with our crazy mismatched schedules. Though we had only caught up a handful of times at industry events, Joy knew that I'd appreciate the invite to the conference - even if only to admire what was going on with the food for the day. And good gracious, she was right. So for today's post, I wanted to pay particular attention to the most important meal of the day: breakfast. 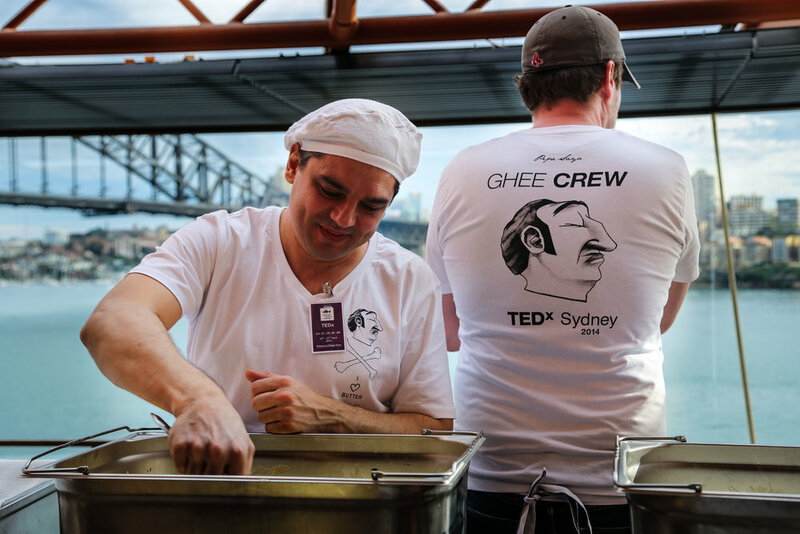 The food at this years TEDx Sydney conference was thoughtfully sourced and beautifully presented. Every single ingredient came with a story of hope and cultural discovery. 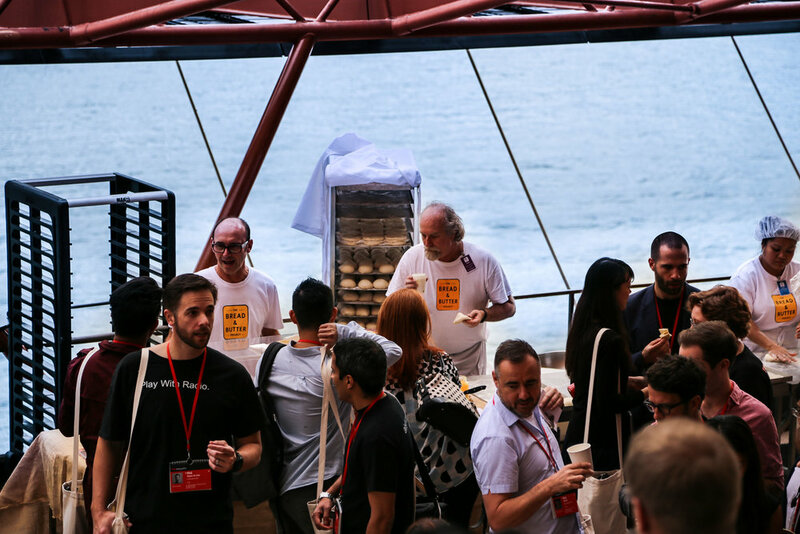 For breakfast, there were food and coffee stations throughout the Opera House foyers where Australia's budding entrepreneurs gathered to fuel up for what we all hoped would be a day of pure inspiration. Thanks to Joy, I had the opportunity to meet Pierre Issa, the man behind the much loved artisan brand, Pepe Saya Cultured Butter. 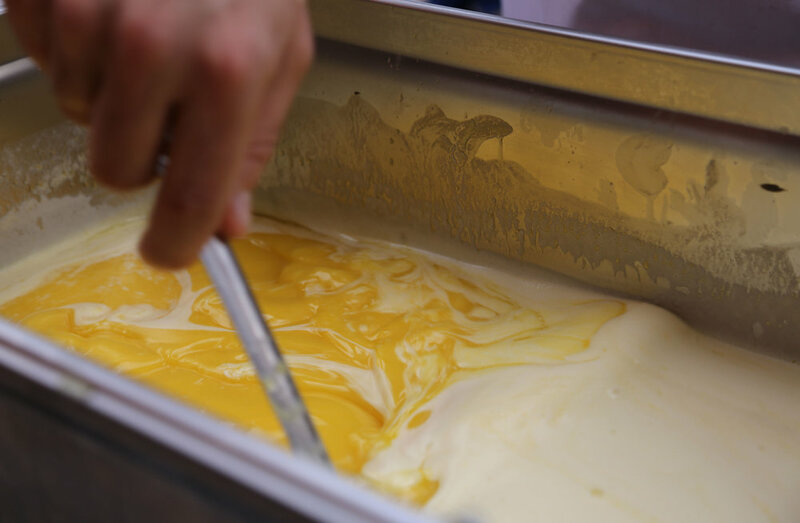 We got to have a chat as he melted down the butter that would become the ghee served with lunch later that day. As a young boy, Pierre was given the nickname Pepe, as his name wasn't a match for the monocultural Australian playground of the 1970's (much like my big sister who went from Jamila to Jeannie after her Kindergarten teacher decided that Jamila was too hard for other kids to pronounce. No kidding.) After talking about the difference between zibdee and sumnee (arabic for butter and ghee), I enjoyed a piece of fresh bread lovingly baked onsite by the the crew from The Bread and Butter Project. Bread and butter... it's always the simple things that open my heart to the greatest experiences.